We measured about 33 miles (loop) in about 4 hours. We stopped often for pictures and snacks. We went clockwise as advised. We rented at All Mountain Cyclery in Boulder City, just a few blocks off the trail. The name of the trail comes from the mountains that you ride around. 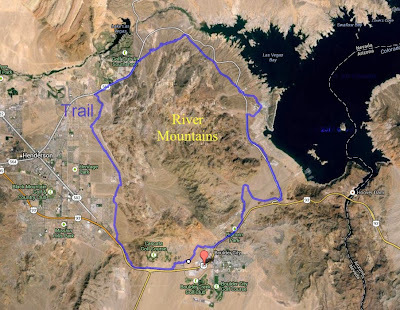 13 billion years ago, the mountains were 12 miles to the east, on the other side of the Colorado River. Left: Just starting the ride at Bootleg Canyon Park Trail Head, View Towards Needles. Right: View toward Las Vegas. Right: Lake Mead View Toward Rock Island. Mileposts 14.5 and milepost 26.0. Left: Elevation at Bootleg Canyon Trail Head, 2694.0 feet. Right: Podaxis pistallaris – Desert Shaggy Mane along the trail. Left: Mountains That Moved Sign. Right: Trail Outlined on Map.